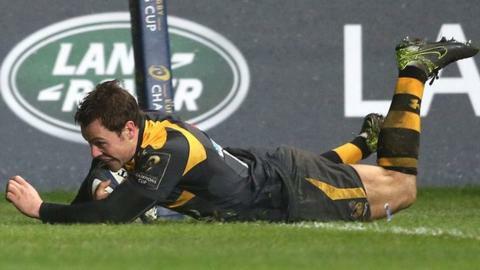 Wasps trio Rob Miller, Josh Bassett and Brendan Macken have signed new, unspecified-length contracts with the Premiership club. England Saxons full-back Miller has scored seven tries in 35 appearances since signing from Sale in 2014. England Under-20s wing Bassett arrived from Bedford in 2013 and has scored 27 points in 21 appearances. Ireland Under-20s centre Macken is yet to make his first-team debut since signing from Leinster in May 2015. Wasps' new contract announcements came on the same day that they confirmed the impending departure of fly-half Alex Lozowski to Saracens at the end of this season. They follow the new contract deals announced for captain James Haskell and fellow loose forward Nathan Hughes last week. Haskell is one of four Wasps players in the first 33-man England squad named by new coach Eddie Jones for this year's Six Nations, along with lock Joe Launchbury, prop Matt Mullan and uncapped centre Elliot Daly.